I’m always trying to get better at what I do. It takes tome to learn new tricks and techniques and improve old ones. This rendition of a Russian AN-2 in flight somewhere over Siberia in the 1950s is much better than the one I did a few years ago. This is sort of a doodle for a couple of other images I want to do which will include an AN-2 or two. The AN-2 was built by the Antonov Design Bureau which is still in existence in the Ukraine. As the AN-2 is a biplane, making it more complicated to portray than single-wing aircraft, I first tried out a few things I learned to do on something simpler. Two Dassault Super Mystère B2 fighter bombers from the Israeli Air Force (IAF) 105 Squadron (Scorpion) in flight over a mountainous desert landscape; circa 1967. The Super Mystère was the result of progressive improvements in earlier Dassault aircraft which were also flown by the IAF. The Super Mystère went into production in 1957. Israel acquired its first aircraft of this type a year later. They saw service in both the 1967 Six Day War and in 1973 during the Yom Kippur War. It was the first aircraft flown by the IAF which could attain supersonic speeds in level flight. IAF pilots liked the aircraft feeling it was a good match for the MiG-19. The image of the Super Mystères is available on various products at one of my Zazzle stores. The AN-2 should appear there at some time in the near future. 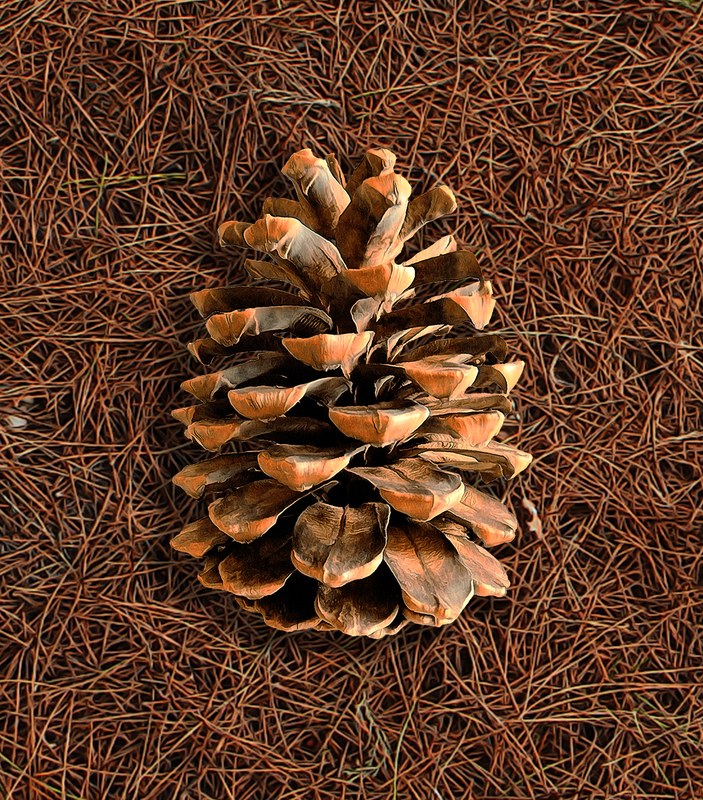 I thought a digital rendering of a pine cone that I picked up in Ma’alot in northern Israel, would look nice with a quotation from naturalist John Muir. 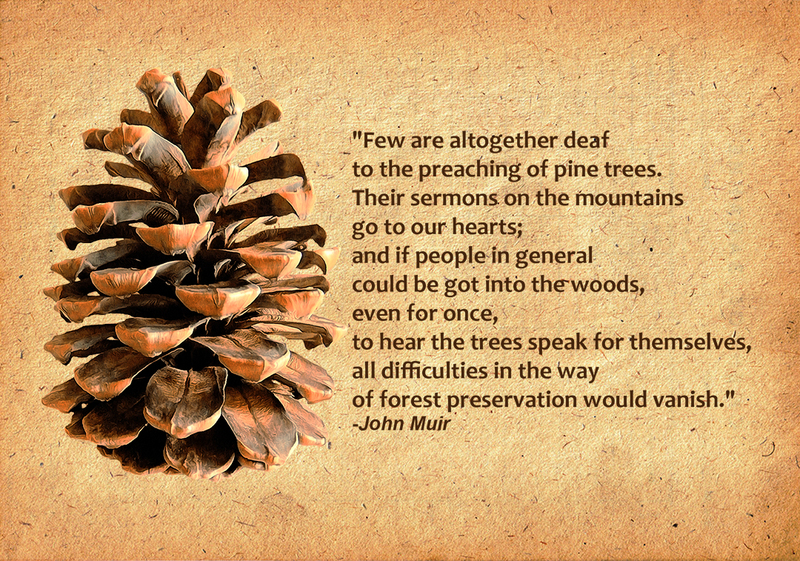 Muir was an early advocate of wilderness preservation in the United States, particularly in the west. Where the slopes are covered with pine forests, the Galilee reminds me very much of the western parts of North American. Jews began planting pines in the 1930s to reforest lands damaged by neglect and overgrazing by goats when under Turkish rule. Pines were chosen, in part, due to the fact that most of the “olim,” Jewish immigrants, were from Europe and pines looked normal to them. Eventually, the pine forests came under criticism, referred to as pine tree deserts, monotonous and sterile. Many people wanted to see native species reintroduced. However, in recent years much of the criticism has died away. It seems the pines have promoted the rebuilding of the soil. Native undergrowth and tree species, as well as wildlife, are making a comeback. And I can attest that sometimes the smell of pine resin is just wonderful. The oil tree is also mentioned verses 31 and 33 of the same chapter, as well as in Nechemia VIII, 15. The oil tree features close to other impressive trees in the description of the vision of the redemption, in the blossoming of the desert and the arid land. In the Mishnah and other rabbinic literature, the oil tree is mentioned as a tree that was used for kindling the beacons that were lighted to announce a new month. There is a mention of pine trees in the Mishnah in the context of the various trees which were used for burning the “red heifer”. There are also those who hold that pines were among the trees used for kindling the beacons to announce a new month. Here is another view of the cone, superimposed on fallen needles. The Aleppo pine blossoms and flowers in the spring. The male cones are shed after the flowering while the female cones develop into fruit. The cone stays closed on the tree until a heavy sharav [hamsin], when it opens and its seeds are scattered. Click on image to see full-size view. This is a label from Singing Jackal Amber Ale brewed by mythical Nimrod Brewery in Israel. The label features a the Golden Jackal (Canis aureus). 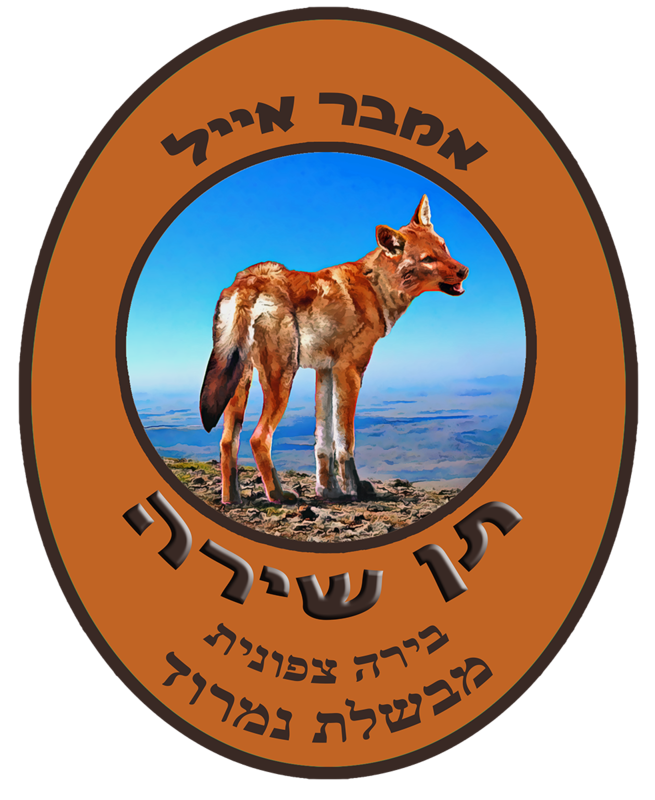 Hebrew text above the jackal reads “Amber Ale.” Additional Hebrew text below the jackal reads “Tan Shirah” (Singing Jackal), “Bira Tsafonit” (Northern Beer) to indicate it was brewed in the Galilee or the Golan Heights, and “Mivshelet Nimrod” (Nimrod Brewery). The jackal, closely resembling and filling much the same ecological niche as the North American Coyote, is the most common predator in Israel. It is often found near inhabited areas, where it feeds on fruit, vegetables, offal, and carrion. It also preys on small animals. The eerie howling, or singing, of jackals often fills the night air. Occasionally, I will see one or two lurking at the edge of heavy vegetation. Jackal numbers in Israel have increased greatly in recent years. This is due in part to careless disposal of food waste and animal carcasses. Jackals will sometimes work together as do wolves to attack farm animals and wildlife such as gazelle in the Golan Heights and the Galilee. And rabies is an ongoing concern. As is often the case the image is available on many items at one of my Zazzle stores. Search for “jackal”.